The demand for demonstrating the relevance and impact of research at higher education institutions is increasing at the same time, particularly in developing nations in which funders are becoming impatient with a perceived lack of results. In a recent visit to the University of Pretoria, the African Union Commission's chair, Dr Nkosazana Dlamini-Zuma, encouraged academic communities to participate more actively in the realisation of the developmental needs of the continent, with particular reference to the African Union Agenda 2063.3 At the same time, research institutions around the world are deeply affected by greater global competition for talent and funding, while dealing with local and regional calls for relevance in addressing societal problems. Searching for solutions (to todays' global challenges) requires that the scientific community operates in fundamentally new ways... Developing effective solutions requires converging approaches, such as the integration of knowledge from the life, physical, social, and economic sciences and engineering... Research-performing and training institutions, such as universities and research institutes, have critical roles to play...it is essential that they develop appropriate training programs and help stimulate multidisciplinary international collaborations. The call for a 'fundamentally new' approach to interdisciplinarity (collaboration between disciplines), trans-disciplinarity (involving knowledge 'generators' beyond academia), internationalisation and social responsibility of research articulated in this statement appears to be central to virtually all discussions on the future of research institutions globally. In this opinion article we reflect on the challenges and opportunities that these developments hold for African research universities. 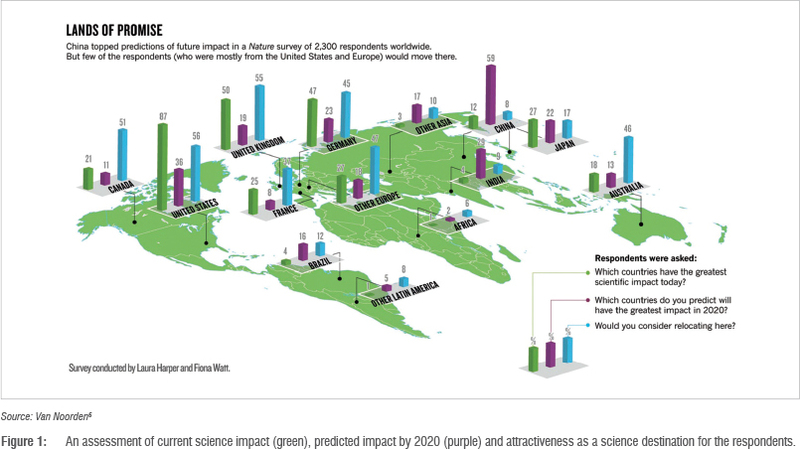 The journal Nature recently published the results of an investigation of global internationalisation trends in research. Findings were fascinating, if not completely surprising to those working actively in leading research institutions, and attested to the fact that 'a fundamental shift is taking place in the geography of science'5. The first key finding related to the numbers of authors of research papers. In the journal Nature itself, the number has increased 400% since the 1950s. Papers with 100 authors were rare in the 1980s, but today such papers are common, with a growing number of papers with over 1000 and even over 3000 authors. Secondly, collaborations between nations have skyrocketed in recent years. While no country shared more than 1000 joint papers with any other nation by 1980, today the USA shares tens of thousands with various nations. Importantly, regional networks, particularly in Asia, appear to be 'reinforcing the competence and capacity of emerging research economies, and changing the global balance of research activity'5. A second article in the same issue of Nature illustrated how extremely mobile the best research talent is today, and that these patterns of global movement are biased towards developed nations in particular, which have long benefitted from a skewed distribution and movement of researchers.6 Although the trend is changing with increasing research opportunities in some developing nations, the analysis contained a warning that uncertainties about local research environments and culture may very well influence this change. For example, while China is seen to hold great research opportunities and future impact, few emerging researchers consider relocating there (Figure 1). For those who take cognisance of these trends, there are opportunities to position themselves to retain and attract the best talent. Some Asian institutions in particular have made great use of this opportunity in recent years with a number of innovative initiatives.7-9 These initiatives include establishing 'satellite labs' for excellent young researchers; focused programmes to attract ambitious and talented young stars; development programmes for local talented researchers in high-quality overseas laboratories; and partnerships with leading international institutions. The flip side of this trend of course is that those who are unable to compete for this global pool of talent also stand to lose their own best talent. Science in Africa has long suffered for this reason and our continent must urgently find ways to reverse its brain drain. That is not to say that funding opportunities for international research networks and projects in Africa do not exist. They do, and they are increasing with many funders investing substantially in research on sustainable development.5,10 Much of this funding is earmarked for developing international, interdisciplinary research networks and research projects. There is broad agreement that the scale and complexity of challenges facing society requires more than just the power of international research networks. It also requires investment in stimulating convergence between the engineering and the natural, human and social sciences.4,11,12 Issues such as water sanitation and health, food security and environmental sustainability, climate change, natural disasters, conflict, poverty and displaced populations are all interconnected issues that transcend both national and disciplinary boundaries. For many of these problems technological solutions exist, but governance or social issues often block their effective use. There are significant obstacles to the integration of knowledge and to the development of true engagement across and beyond scientific boundaries. The resistance (at least to some extent) has to do with the deeply ingrained structures and systems focused on disciplinary distinction that exist at established research institutions. Such boundaries are easier to overcome at younger universities, which some have used to their advantage. For example, Bertil Andersson, President of the Nanyang Technology University in Singapore, ascribes the meteoric rise of this institute to the 76th position on the Times Higher Education list of world universities to its research agility.7 At this and other 'rising star' institutes, they have succeeded in implementing structures (from undergraduate teaching to research focus areas) that transcend traditional disciplinary boundaries. The complexity of developing effective interdisciplinary projects should not be underestimated,11,13,14 and interdisciplinarity should not be seen as a magic solution to all complex problems. Some issues will remain the remit of disciplinary focus and depth. Excellence in interdisciplinary science relies on effectively connecting disciplinary excellence, not replacing it. But making such connections effectively is a field of specialisation in itself; it requires expertise and time to define common goals, a shared understanding of different perspectives, a common purpose and the development of effective means of communication. Where effective, such interdisciplinary projects can, however, have far more potential to deliver novel insights and innovations which address complex problems than narrow disciplinary approaches. The impact of interdisciplinary research has recently been demonstrated through retrospective analyses of almost 18 million papers spanning all scientific fields. In this study, Uzzi15 and colleagues showed that the highest impact research is grounded in disciplinary excellence (i.e. relying on depth of knowledge in a specific field), but with a simultaneous lateral contribution from other fields (i.e. integrating ideas across fields). Such combinations made a paper almost 100% more likely to be classified as high impact (Figure 2). The authors concluded that scientific progress appears to require parallel efforts along two seemingly opposing, yet in reality complementary, extremes - conventionality and novelty. A number of recent studies15-17 have also revealed the value of research teams. Firstly, these studies show a direct positive influence of larger teams on the output and impact of papers and patents, across all fields of science. They also show that the larger the teams, the higher the likelihood that the work is integrated across disciplines and the greater the impact of the papers and innovations. 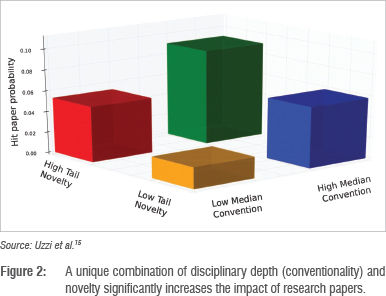 Not surprisingly, an increasing proportion of the most innovative research is done by larger research teams. This effect is even further increased when the collaborating teams include members from elite institutions, giving further motivation to the focus on targeted internationalisation described above. The increased impact of teams is rooted in the collective capacity and abilities of research teams, which are also the same qualities that make them more attractive to large international research networks and give them the capacity to develop and lead such international networks or projects. They serve as magnets for drawing other talented researchers for whom such capacity is vital to their career development. Recent decades have vividly shown that traditional definitions of research excellence and training do not automatically resolve the complex problems facing the future of society and the planet. This situation has been called a 'crisis of research effectiveness', considering the lack of progress on a number of critical issues, such as climate change, biodiversity loss and environmental degradation, over the past two decades - a period in which more new knowledge was generated than ever before and significant international declarations such as the Rio Declaration on Environment and Development and the UN Millennium Development Goals were made. This 'crisis' highlights the need for transdisciplinarity as a new frontier for research communities. This new paradigm strives towards a 'new form of learning and problem-solving involving cooperation between different parts of society and science in order to meet complex challenges of society'18. Transdisciplinarity 'starts with tangible, real-world problems' in a joint endeavour through which '[s]olutions are devised in collaboration with multiple stakeholders'18. This approach is also at the heart of the recently launched Future Earth project (www. futureearth.info) of the International Council for Science (ICSU), which attempts to embrace such a transdisciplinary approach to increase the impact of global change and sustainable development research. Without success in these endeavours, many believe that there will be little chance that the world can reverse the unsustainable collision course of current global change, resources use and development trajectories. Kueffer and colleagues13 from the Alliance of Global Sustainability at ETH Zurich (Switzerland) argue that transdisciplinarity will require a fundamental institutional and cultural re-orientation at research universities. In the first place, they argue that this will require a focus to stimulate the development of interconnected (both inter-institutional and interdisciplinary) research teams (as also highlighted above). But they also highlight the complexity of forming research partnerships with actors and experts outside academia, linked to an orientation of research programmes to societal problems. They argue that both institutional innovations and structural optimisations will be critical in achieving these goals, while at the same time it is necessary to preserve the traditional strengths of disciplinary excellence and scientific rigour. ...institutions will inevitably, from here on out, be increasingly subject to comparisons and rankings, and those deemed to be the best in these rankings of research universities will continue to be considered the best in the world. This factor, more than any other, will determine the future of universities, as it will increasingly impact the migration of talent, funding and opportunities. Salmi identifies four factors that can help universities maintain and improve their global competitiveness: a niche focus; internationalisation; innovative teaching and research systems; and a well-formulated and strategic plan. African research institutions are well placed to build effective trans-disciplinary networks which focus on developmental issues. The problems faced by the continent have indeed placed particular emphasis on issues such as natural resource and diversity management, urbanisation and health, bioenergy, agricultural and forestry development, global change and food security. Many academics in these fields continue to work here, or return after time abroad, to be closer to the issues at hand. As previously noted, funding for transdisciplinary teams from this continent is also highly accessible. The number of transdisciplinary networks with an African focus is growing. Examples include the Australia-Africa Universities Network which is currently hosted at the University of Pretoria and has a project portfolio covering food security, health, mining, education and public sector reform. The Universities of Zambia and Cape Town have collaborated with the United Nations to develop a master's degree in Sustainable Mining Practices, which takes a transdisciplinary approach. Other examples include those linked to climate change and adaptation and disaster risk reduction in which extensive university networks have been developed across Africa, e.g. Periperi U/Stellenbosch University (www.riskreductionafrica.org) and the African Climate Change Adaptation Initiative (Open Society Foundations, www.opensocietyfoundations.org), building both research and other academic capacity. Some of these efforts are, however, in their infancy and face a number of challenges. As noted by Adams5, African networks tend to develop along historical and linguistic linkages rather than strategic ones. The opportunity to meet and discuss projects can be hampered by technological and cost constraints, and institutions struggle to attract and retain talent when competing with universities in the developed world. Nonetheless, it is critical for African universities to persist with the development of transdisciplinary projects and networks, and for institutions to incorporate specific efforts in their strategic plans for this purpose. These activities will support higher impact research, which will in turn enable better rankings in the globalised and competitive higher education environment. Ultimately, the knowledge co-produced should help to foster development and address a number of critical challenges facing the continent. We thank Jennifer McKellar for her assistance with the preparation of this manuscript.